Mix the sugar, butter (keep a few cubes behind) semolina and flour and knead well to a dough. Add the ginger and the pistachios towards the end of the process. Roll out the dough and cut in rectangles. Bake the shortbread 20 minutes at 190 degrees Celsius. Allow them to cool down. 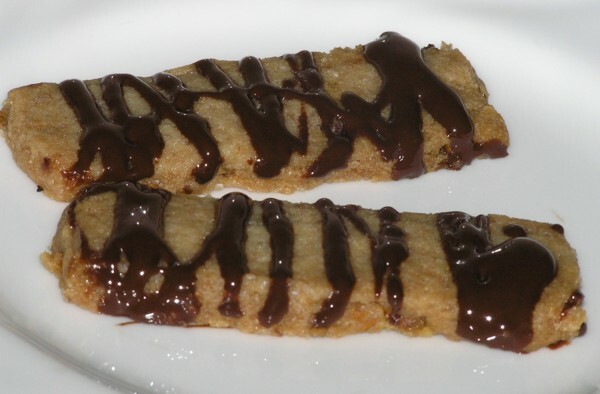 Melt the chocolate with the remaining butter in the microwave and drizzle this over the cookies. 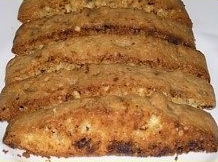 Go to the shortbread page for various delicious shortbread recipes. Beat the butter with the sugar for a few minutes. Add the eggs one by one, keep beating. 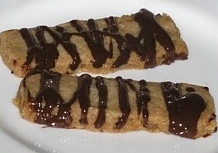 Stir in the flour and the chocolate. Make two rectangular shapes of batter on a sheet of waxed paper and refrigerate half an hour. Bake them 25 minutes at 175 degrees Celsius. Slice the cake immediately in thin slices, put the slices on their side on a sheet of waxed paper. Bake 7 minutes at 150 degrees, turn them and bake 7 minutes more.